Comm Eye Health Vol. 31 No. 104 2019 pp 86-87. Published online 10 February 2019. Director: SuVi Eye Institute & Lasik Laser Center, Kota, India. 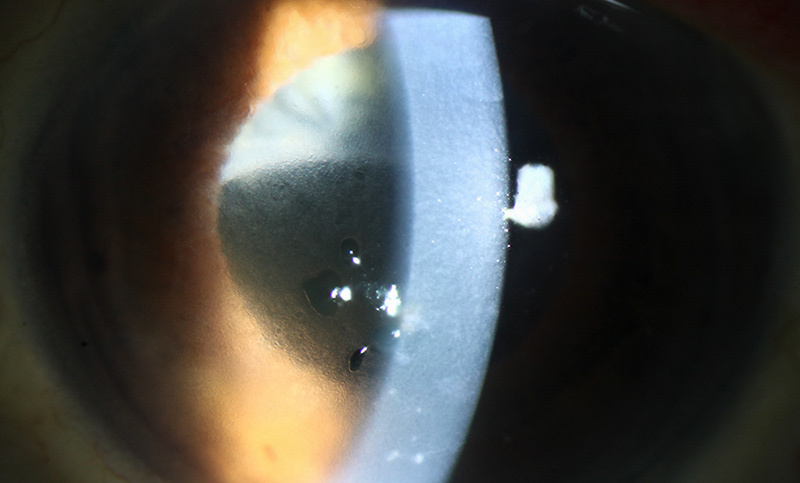 Cataract surgery risks corneal decompensation in patients with Fuchs’ endothelial corneal dystrophy, but it can also be combined with endothelial keratoplasty to address the condition. Fuchs’ endothelial corneal dystrophy (FECD) is a progressive disease which mainly affects the Descemet’s membrane and the endothelium and may eventually lead to corneal decompensation and decreased vision. FECD is treated by performing endothelial keratoplasty: replacement of the diseased inner cell layer of the cornea using donor tissue, e.g. Descemet’s Stripping Endothelial Keratoplasty (DSEK). Patients with FECD often complain of vision loss, which may be attributed to either cataract and/or FECD. Vision loss due to FECD is usually worse in the morning and improves as the day progresses. This is because corneal oedema increases in the night during sleep and reduces as the tear film gradually evaporates during the day. Glare is often a disturbing symptom; it occurs due to confluent guttae or pigment adherent to the endothelium. The presence of guttae is a common sign of endothelial dystrophy. Guttae are excrescences of collagen produced by stressed corneal endothelial cells (see main image above). Guttae form in the middle of the cornea and eventually spread throughout it. 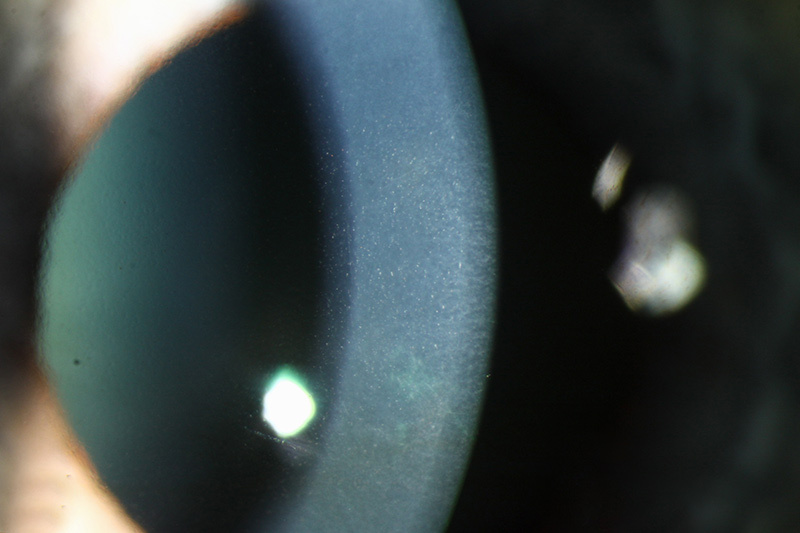 Early cases of FECD may be missed during a cursory slit lamp examination in a busy clinic. Take a careful history of the patient’s symptoms, and ask whether these are worse in the morning. If possible, examine the eyes under high magnification to detect the condition early. Cataract surgeons are faced with the dilemma of determining whether a cataract operation alone will improve the patients’ symptoms, or whether there is a risk that cataract surgery will cause the cornea to decompensate and should therefore be combined with endothelial ketaroplasty. Personalise the treatment plan and consider individual factors such as the cataract density, the health and thickness of the cornea, the anterior chamber depth, and the size of the dilated pupil. The presence of microcystic oedema, stromal thickening and a low central endothelial cell count (less than 1,000 cells/mm2), by specular microscopy, indicates an increased likelihood of corneal decompensation after cataract surgery. In these patients, cataract surgery should be combined with endothelial keratoplasty. In most low- and middle-income countries, a specular microscope might not be widely available. In these situations, central corneal thickness can be used as indirect evidence of endothelial health. This is because dysfunctional endothelial cells are unable to pump water out of the cornea effectively and the corneal stroma swells, thereby increasing the thickness of the central cornea. However, central corneal thickness is variable in the normal population and corneal oedema can still be present in people with normal corneal thickness. They will have to come for regular follow-up visits (tell them where to go, and when, and what financial support is available to cover transport costs). If endothelial keratoplasty is combined with cataract surgery, we recommend using a standard monofocal, aspheric intraocular lens (IOL) with larger optic diameter (6.0 mm minimum). Endothelial transplantation introduces negative asphericity and reduced contrast, so avoid the use of multifocal IOLs. Endothelial transplant patients undergo a hyperopic refractive shift. Thus, where the expectation of decompensation is very high, the IOL power is calculated with a target refraction of -1.25 D. Avoid using an anterior chamber IOL if there is a posterior capsular tear. Both manual small incision cataract surgery (SICS) and phacoemulsification result in a similar amount of endothelial loss.3 The choice of surgical technique is hence debatable and depends on the cataract density, the status of cornea and the surgeon’s experience and comfort with each technique. The authors personally prefer phacoemulsification as it has several advantages (small incision, closed anterior chamber and use of phaco power modulation and fluidics to minimize cell loss). Other surgeons, with greater experience of manual SICS than phaco may prefer the SICS technique. SICS may indeed be the better option when done by surgeons with a great deal of experience in this technique in selected cases such as very dense cataract, small pupil and compromised zonules. The newest addition to the cataract surgery technological portfolio is the femtosecond laser, which can be used to create a capsulorrhexis and divide the nucleus into fragments. This option is expensive and has not yet been shown to produce better outcomes than conventional surgery, so it has not become routinely used, even in the most intensively resourced health economies. A chondroitin sulfate-based dispersive viscoelastic should be used to protect the cornea. It is important to coat the endothelium before doing capsulorhexis. The soft-shell technique, of using a dispersive viscoelastic against the endothelium, followed by a super-cohesive viscoadaptive agent, is particularly effective. Complete removal of viscoelastic must be ensured to prevent a rise in intraocular pressure after surgery. The choice of solution may also contribute to the endothelial cell survival. In units where Ringer’s lactate may be the routine choice, Balanced Salt Solution (BSS) would be preferable for FECD patients. The use of a solution containing glutathione, sodium bicarbonate, and glucose, if available, will create a more physiologic environment and minimise endothelial cell loss. While performing phacoemulsification, the best way to decrease ultrasonic energy is using a mechanical method, such as chopping, to break apart the nucleus. Adjust the power modulations to enable the phaco-machine to deliver shorter pulses or bursts of ultrasonic energy that minimise endothelial cell loss. Whereas the foot pedal of the phaco machine can deliver blocks of 1 or 2 seconds of energy, the power modulations allows much smaller increments, such as 2 to 4 milliseconds. It is advisable to always use a new phaco-tip in these cases and combine lateral phaco (transverse or torsional), with longitudinal phaco. All anterior segment intraocular procedures tend to cause at least some loss of endothelial cells. In the early stages, cataracts tend to be less dense and therefore require less ultrasonic energy for phacoemulsification. In the advanced stages of cataract, the ultrasonic energy, combined with the fluid flow through the anterior chamber, may cause a higher degree of endothelial cell loss. It may therefore be appropriate to perform a cataract operation at an earlier stage if phacoemulsification is an option. Viscoelastic should be periodically re-injected into the anterior chamber as the irrigation fluid can wash it away during phacoemulsification. The flow of irrigating solution can create currents against the endothelial cells, inducing damage. Use low-flow parameters, make snug incisions and stay away from the corneal endothelium. With compromised endothelial cell function, incisions may not seal securely and placing a suture would be better than excessive corneal stromal hydration. Pre-operative patient counselling is essential in order to ensure a positive outcome. 1 Eghrari AO, Gottsch JD. Fuchs’ corneal dystrophy. Expert Rev Ophthalmol.2010 Apr;5(2):147-159. 2 Seitzman GD, Gottsch JD, Stark WJ. Cataract surgery in patients with Fuchs’ corneal dystrophy: expanding recommendations for cataract surgery without simultaneous keratoplasty. Ophthalmology 2005;112:441-6. 3 George R, Rupauliha P, Sripriya AV, Rajesh PS, Vahan PV, Praveen S. Comparison of endothelial cell loss and surgically induced astigmatism following conventional extracapsular cataract surgery, manual small-incision surgery and phacoemulsification. Ophthalmic Epidemiol. 2005;12(5):293-7. 4 Yamazoe K, Yamaguchi T, Hotta K, Satake Y, Konomi K, Den S, Shimazaki J. Outcomes of cataract surgery in eyes with a low corneal endothelial cell density. J Cataract Refract Surg.2011;37(12):2130-6.